Sometimes the best solution is the most simple one. This charging station is probably the most plain one you’ll come across, but it hids the cords and it attaches to the wall. All around it will easily simplify charging your smaller gadgets. 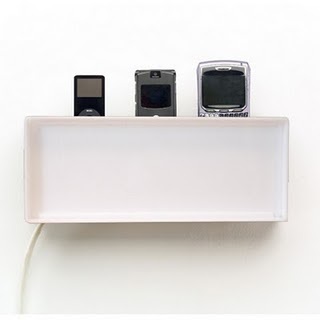 If you don’t want a charging station that draws attention to itself, then this one would be a great solution. The front of it offers easy access to the surge protector. You just slide the front open and it reveals the insides to make it simple to plug in different chargers. Unfortunately the surge protector isn’t actually included with your purchase. When you go to purchase one you’ll be able to choose between the white shown here or black. The charging station will cost $29.99. Then you can throw in a 6 outlet surge protector for $12.99 from KangaRoom. Very functional and useful to have. I would definitely get one or two to put throughout the house.